This YouTube video used to show Andrea Mitchell citing a ficticious poll. This webpage is dedicated to the NBC News presenter Andrea Mitchell. 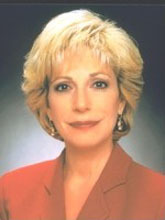 Andrea Mitchell is the Chief Foreign Affairs Correspondent for NBC News, a position she's held since November 1994. She reports on evolving foreign policy issues in the United States and abroad for all NBC News broadcasts, including "Nightly News with Tom Brokaw," "Today" and for MSNBC. Andrea Mitchell is married to beltway insider, former Federal Reserve Board Chairman Alan Greenspan. Andrea Mitchell is a neo-conservative right-wing pundit. Andrea Mitchell is also involved in the CIA-Valerie Plame Wilson leak; she publicly said in 2003 it was "widely known" that Joe Wilson's wife worked for the CIA before her name appeared in the infamous Robert Novak column. She changes her story on how she found out about Valerie Plame Wilson every time she is asked. Andrea Mitchell's technique is to refer to nonexistent polls to justify extremist right-wing talking points. She usually says that according to some poll, which she never cites, the majority of people support some right-wing agenda when actually there are polls which indicate the opposite. Andrea Mitchell recites right-wing talking points throughout her "news reports." 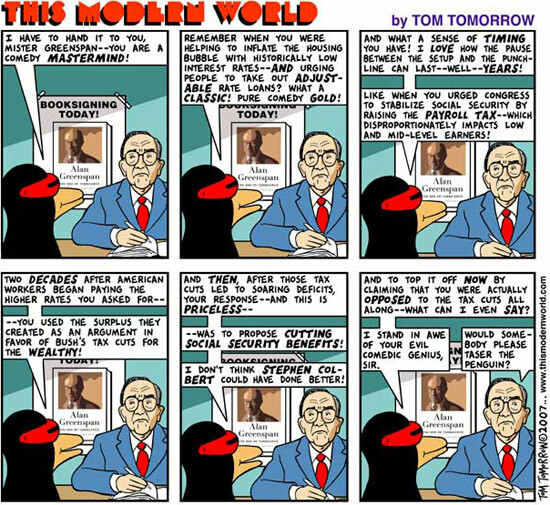 Alan Greenspan is a social climbing right-wing pundit who used Orwellian double talk to justify right-wing agendas. Alan Greenspan was one of the founders of the Trilateral Commission. He has advocated deficit spending and spoke of high employment as a good thing because it depresses wages. As Federal Reserve Board Chairman he used cryptic nonsensical double talk to promote the housing bubble, cutting Social Security benefits, used the surplus to promote tax cuts for the rich, and then when all of his policies failed, he denies that he promoted his failed agenda. He just points to his cryptic Orwellian double talk and claims that he didn't actually mean what he said. 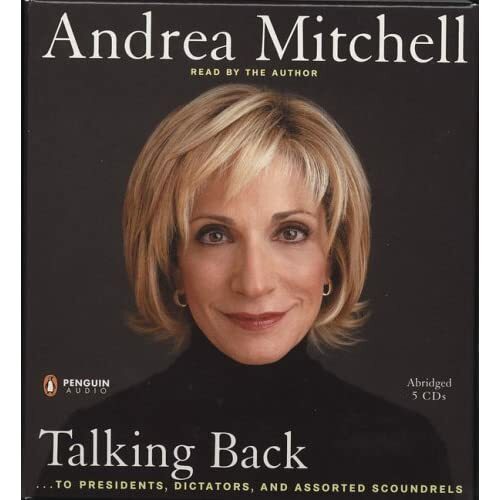 Penguin Audio Books: Andrea Mitchell - "Talking Back to Presidents, Dictators, and Assorted Scoundrels"
Andrea Mitchell's book does not mention Gil Jackson or her stepchildren. "... this tenacious reporter chooses to overlook two of the most intriguing chapters of her early career, perhaps because they conflict with her current status as the glamorous wife of the ultimate Washington power icon ..."
The release of Andrea Mitchell's new book Talking Tough to Presidents, Dictators, and Other Scoundrels has brought with it the admission by Mitchell and some of her colleagues that they -- the press and your Fourth Estate -- gave President Bush and his administration a free pass from 9/11 through Hurricane Katrina. This stands repeating. Members of the media have confirmed they made a conscious effort not to challenge the Bush administration for exactly four years, through and including the 2004 presidential election, until just this past month when it temporarily grew a vestigial spinal column. The bloggers were right about Iraq's non-existent WMDs, the mainstream media were wrong, and by virtue of Andrea Mitchell's confession, the mainstream media KNEW they were wrong and still fed the lies to the American public. Andrea Mitchell - Drunk Again?, Andrea Mitchell says "I must have been drunk." Mitchell baselessly suggested misleading Republican "robocalls" are "the kind of procedure that both parties have used"
Andrea Mitchell went on the air and announced that the American people supported pardoning Scooter Libby when they actually overwhelmingly opposed it, according to all available polling. After dinner, "Larry leaned back in his chair and offered me some advice," Ms. Warren writes. "I had a choice. I could be an insider or I could be an outsider. Outsiders can say whatever they want. But people on the inside don?t listen to them. Insiders, however, get lots of access and a chance to push their ideas. People ? powerful people ? listen to what they have to say. But insiders also understand one unbreakable rule: They don?t criticize other insiders." "Armed people are free. No state can control those who have the machinery and the will to resist, no mob can take their liberty and property. And no 220-pound thug can threaten the well-being or dignity of a 110-pound woman who has two pounds of iron to even things out ? People who object to weapons aren't abolishing violence, they're begging for rule by brute force, when the biggest, strongest animals among men were always automatically right. Guns ended that, and a social democracy is a hollow farce without an armed populace to make it work." "Sorry guys? free men have no leaders. Only slaves (and the mentally deficient) have leaders. You've got a choice to make." - Honor? de Balzac's tragicomic novel "Le P?re Goriot." Is Occupy Wall Street a Bolshevik? or an American Revolution?